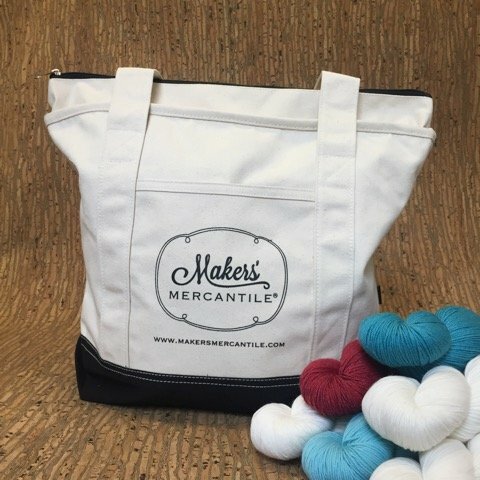 The Makers' Mercantile Exclusive Tote has a large main compartment featuring a zippered closure, for keeping the contents of the bag secure inside. Fill it with your craft project, favorite book, bottle of water... and have room left over for all kinds of stuff! One front slash pocket creates quick and easy access to small items such as a sunglasses. Bag straps are 26-1/2" long, for carrying by hand or over the shoulder, and the size is a very generous 15" x 21" x 7". 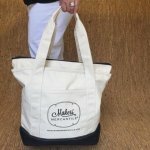 The bag is manufactured in China and the logo is applied in a shop in Massachusetts.